Our own performance data and bespoke sampling exercises help us to understand how we are responding to the challenges of hate crime prosecution. In addition, we make use of external research and reports from academics, parliament, the government and community stakeholder organisations to improve our understanding and awareness of hate crime, how it operates and its impact. The sections below provide a outline of some of the relevant work that we have taken account of in recent years. 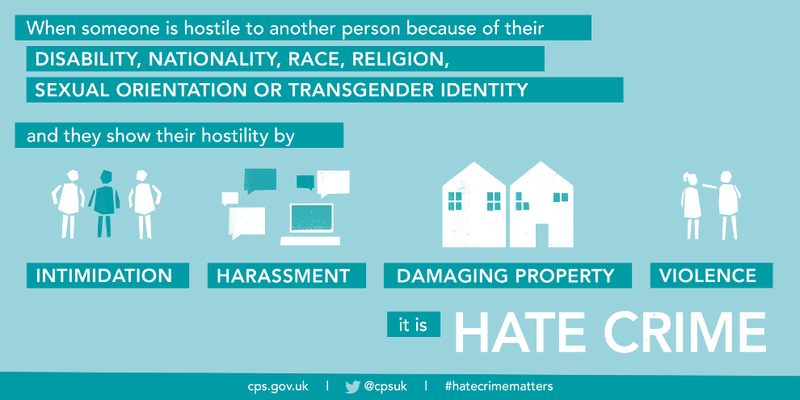 We ran a social media campaign called #HateCrimeMatters to help people understand what hate crime is, and what can be done about it. These strands are covered by legislation (sections 28-32 of the Crime and Disorder Act 1998 and sections 145 and 146 of the Criminal Justice Act 2003) which allows prosecutors to apply for an uplift in sentence for those convicted of a hate crime. "Any criminal offence which is perceived by the victim or any other person, to be motivated by hostility or prejudice, based on a person's disability or perceived disability; race or perceived race; or religion or perceived religion; or sexual orientation or perceived sexual orientation or transgender identity or perceived transgender identity." There is no legal definition of hostility so we use the everyday understanding of the word which includes ill-will, spite, contempt, prejudice, unfriendliness, antagonism, resentment and dislike. Once a hate crime has been reported, the police investigate whether a hate crime has been committed. They refer cases to the CPS to decide whether there should be a charge. We are responsible for preparing and presenting hate crime cases at court and applying for an increased sentence. We need enough evidence to convince the court that the crime was motivated by or demonstrated hostility. We also work with Witness Care Units to provide information, assistance and support to victims and prosecution witnesses. 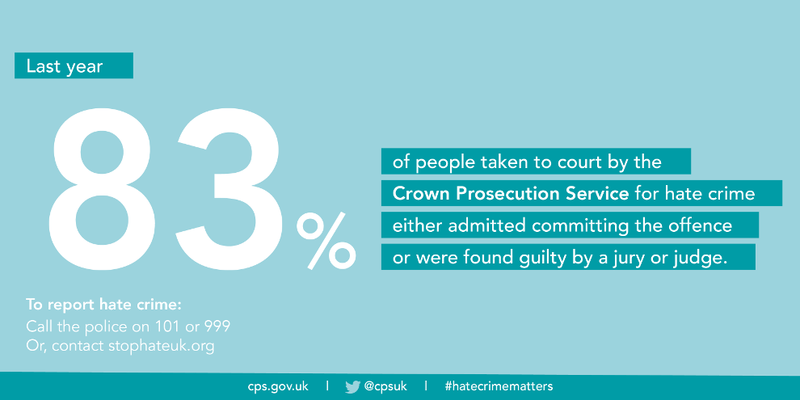 In 2016/17, 83% of hate crimes cases we prosecuted led to a conviction or guilty plea. Because of the serious nature of these offences, the CPS can apply to the courts for a 'sentence uplift' which is an increased punishment for the crime. Last year, more than half of our requests led to offenders having their sentence increased because it was motivated by hate. The CPS Hate Crime annual report provides an overview of performance and activity and is backed up by a more detailed data report for the year along with a separate report on Area performance for the year. Inspectors from HM CPS Inspectorate and HM Inspectorate of Constabulary and Fire & Rescue Services analysed the handling of disability hate crime cases by the police and CPS. This is the CPS response to the report. The hate crime strategy is an overarching framework to address crimes that meet the National Police Chiefs’ Council (NPCC) and the CPS agreed definition of hate crime. The CPS Hate Crime Newsletter provides updates on how the CPS is tackling Hate Crime. Our public policy statements explain the way we deal with and prosecute hate crimes and what victims and witnesses can expect from us. Email HateCrimeSchoolsProject@cps.gov.uk, specifying the pack(s) that you would like. We are proactive in seeking feedback and information to support more effective prosecution of hate crime. This includes the nature of offending and its impact, awareness and understanding amongst communities concerned and our effectiveness in response. In supporting this, we work closely with community-focused organisations, criminal justice partners and others. Hate crime - What it is and what to do about it - This is a short guide about hate crime; what it is, what you can do about it and who can help. Hate crime: what it is and how to support victims and witnesses - This guide is about hate crime and how to help those who may be victims of this kind of offending behaviour. It is designed for people working in voluntary organisations, as well as frontline staff in health, housing or social welfare – in fact anyone who might be the first to hear about an incident. Support for disabled victims and witnesses of crime - This guide is about the support available to disabled victims and witnesses of crime. There is a wide range of organisations who support victims and witnesses of hate crime. You can find out more about some of these organisations on their websites.